Thanks for posting this…..shall try and catch up on this one! Another great review kathy. I just finished the movie and liked it very much. Even though it’s not great as last week’s queen. But a very well enough romcom. Plus second half being more interesting than the first half works great. Performance are good. No complaints music is good with one or two catchy songs. A special mention to sonam’s own wardrobe. All cloths she’s wearing in movie are from her own wardrobe. she is truly fashion fiesta. How two different types of delhi girls we saw in just two weeks. Rani from queen and mayera in this movie. Both delhi girls both extreme opposite. 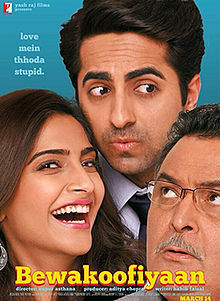 What I like about Bewakoofiyaan is that it’s a very good example of what it’s supposed to be. It’s an ’80s-style, American romantic comedy. It’s not going to win any awards or anything, but the writer and director show a lot of respect for the audience anyway. I appreciate that.